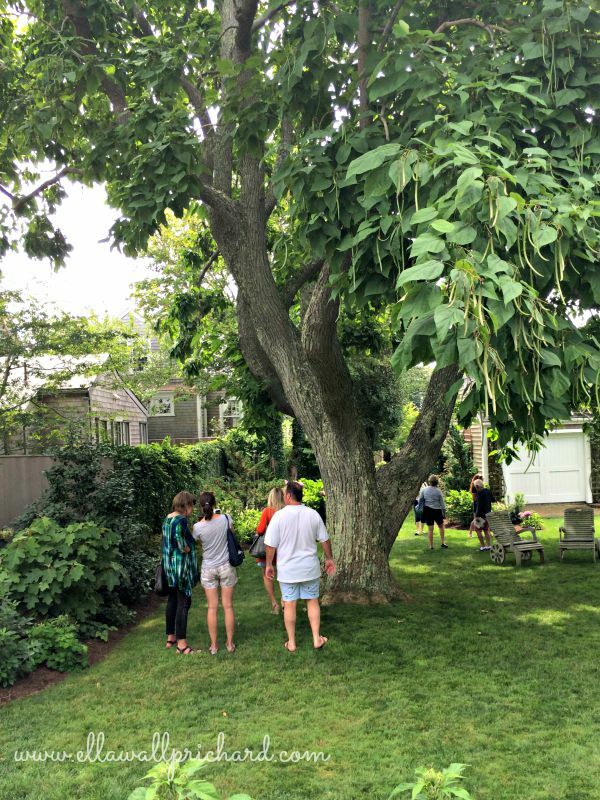 The Nantucket Garden Club held its annual home and garden tour while we were there in July–eight homes on historic Darling and Farmer streets. 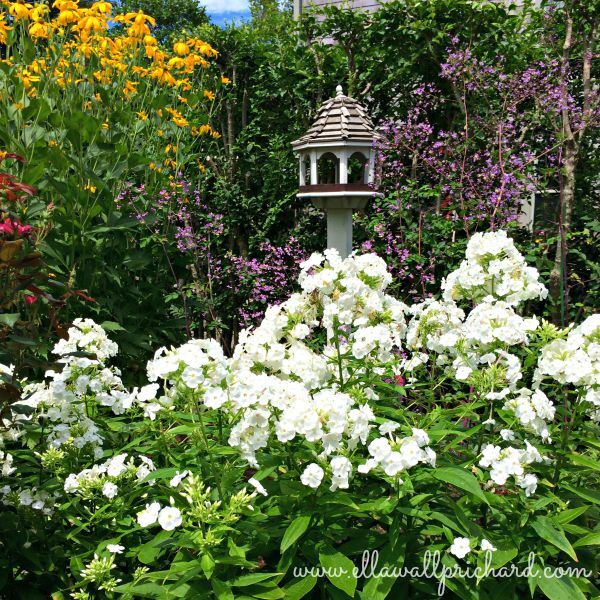 Since Nantucket was laid out in the Colonial period, when houses were at the front of deep, narrow lots, getting to peek in these hidden gardens is a rare treat. 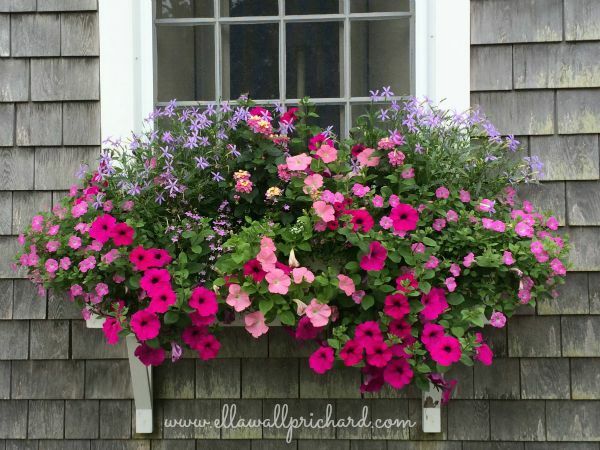 Only the ubiquitous window boxes give a hint of residents’ passionate love for flowers and summer color. 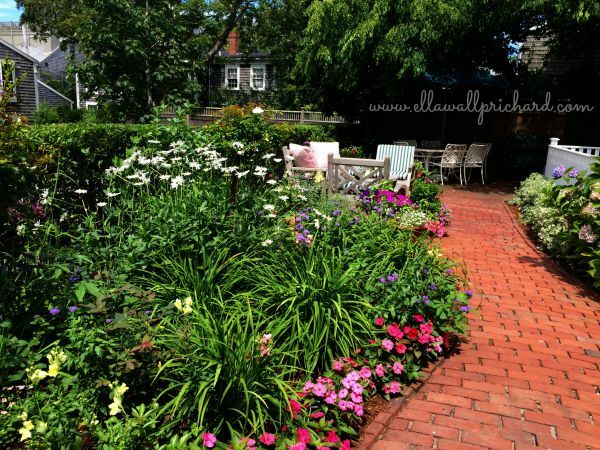 Most gardeners have divided their outdoor space into a series of outdoor rooms–clearly delineated rectangular or square plots defined by hedges, flowers, walks and terraces. Living and entertaining spaces are often at the side of the house, a hedge protecting privacy and a path leading to the front walk so guests can enter the garden directly. Outdoor kitchens, prep and serving spaces are off the kitchen door, screened by tall plants, often with herbs and vegetables growing in the beds. 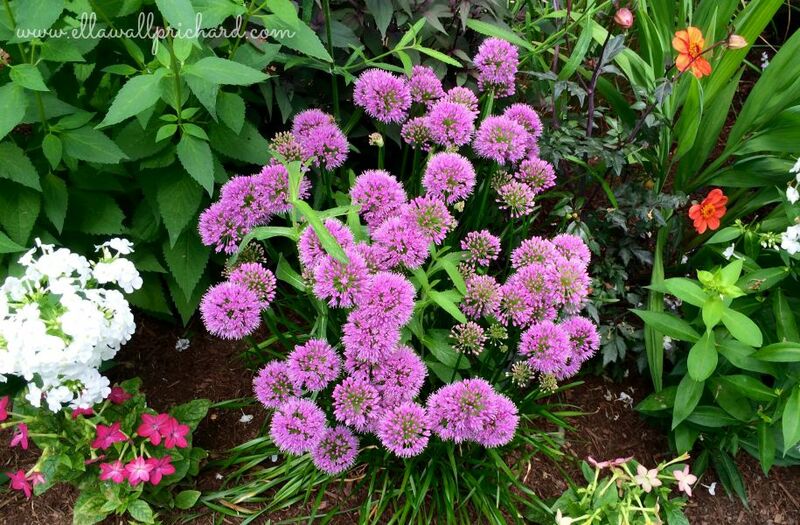 Since the growing season is only a few months, gardeners rely on perennials and bulbs that die back in winter but reappear in late spring. Annuals fill in the bare spots. June roses are supplanted by hydrangeas in July. Throughout the summer, some flowers are faded, some in full bloom and others just beginning to bud. This requires careful planning and a thorough knowledge of the characteristics of each specimen. 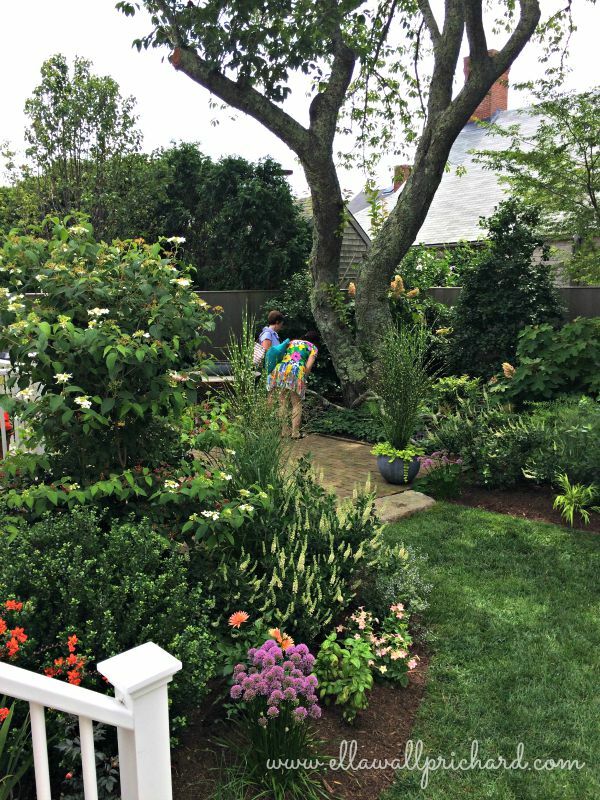 After long winters with short days, Nantucket gardeners are ready for color, embracing opposites on the color wheel–blues and orange, purples and yellow. 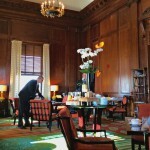 In this cool climate, sunny spots are welcome; but hosta and other shade-loving plants grow under huge, ancient trees. Impossible in South Texas? No, I don’t think so. 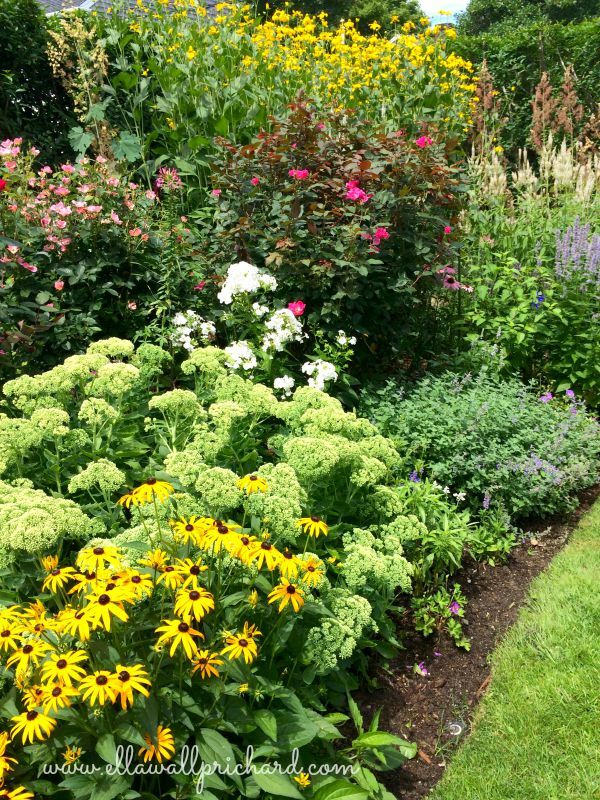 First, instead of envying lush Southern lawns or the lavish English gardens of the Northeast, let’s embrace our long, long growing season. In fact, let’s accept the fact that our summers have extreme weather just as Yankees have extreme weather in winter. Keep the garden alive and watch for insects. Don’t prune. Don’t fertilize. Enjoy the few plants like oleander, bougainvillea, zinnias and periwinkle that thrive in hot weather. Plant cool Boston fern and caladiums in your shady spots. As spring flowers die, cover the ground with mulch. I like the look of pine needles, sold by the bale at Gill’s. Celebrate the fact that we have two long seasons for spectacular flowers–from September until Christmas and from February to May. 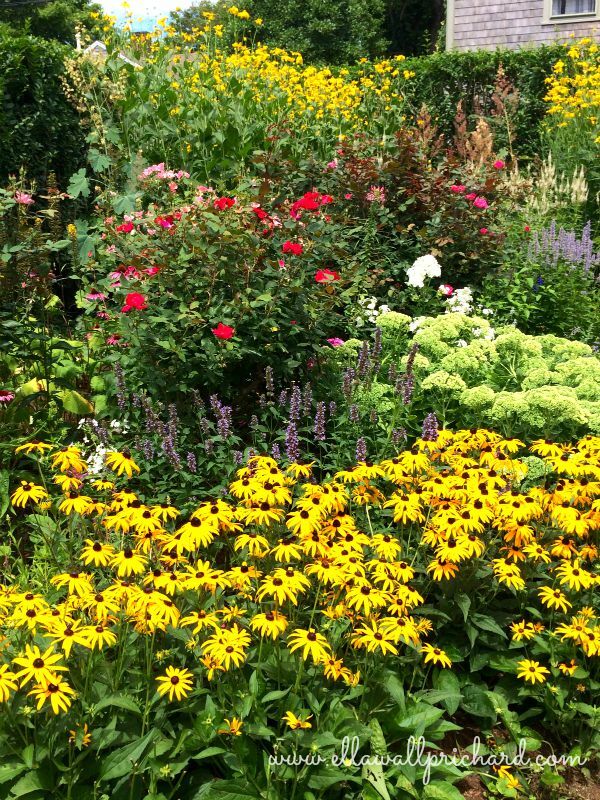 In fact, it’s not too early to begin planning our fall gardens. The week before Thanksgiving is the time to get plants like snapdragons and stock in the ground for winter bloom. We can have four blooming cycles for our roses if we prune and fertilize in mid-February and early September and then again six weeks later. In my experience, our thick clay soils, combined with periodic monsoon rains, are our biggest obstacle. Add lots of peat moss and sand, have good drainage and mulch. Pines, magnolia and azaleas that I planted in 1971 in fill dirt in raised areas of the yard are still alive; but I have abandoned my efforts to re-create the gardens of New Orleans and East Texas. Slowly, I have moved toward a Mediterranean garden, with hints of Charleston–allowing Boston fern to grow wherever it’s happy. George Porcher designed my gardens at both my homes. 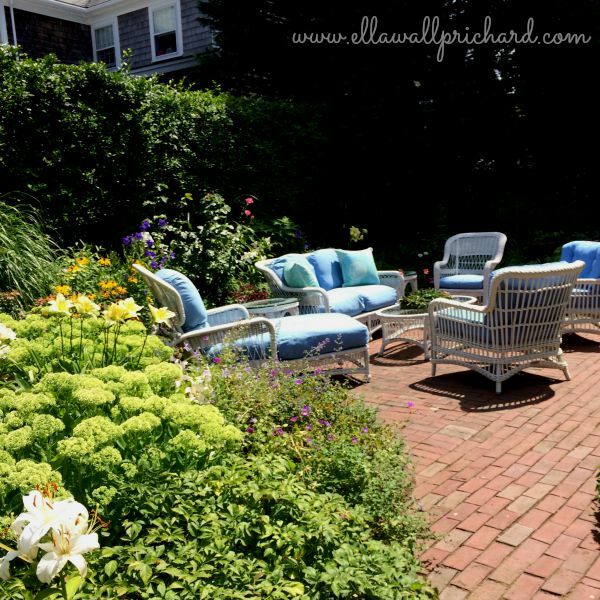 When we built this house on a deep, narrow lot, he taught me about outdoor rooms, the importance of progressing from one intimate space into another–exactly what I saw in Nantucket. 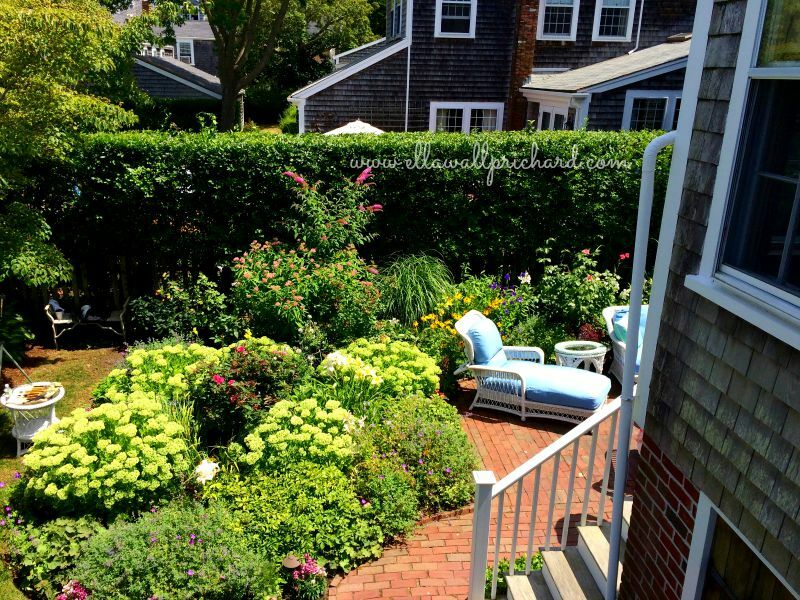 Many of the smaller homes in Nantucket have no grass, because it’s hard to establish a lawn in such a short growing season. I, too, have no grass! I had only two requirements when we built this house: one story, no grass. I have shed fertilizer, cinch bugs, grub worms, most water restriction issues, lawn mower and edger. Sheer joy! 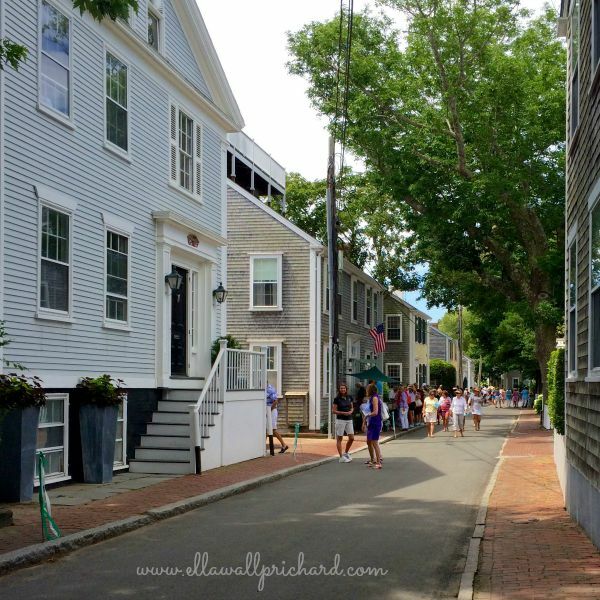 Note: I created several photo albums of specific Nantucket sites and events on Facebook during two extended stays there this summer. You can view them here. Ella, what a beautiful post. Seriously, with your eye for photography, check out Instagram!!! Thanks! You know both places. 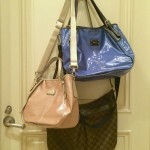 My initial experiment with Instagram wasn’t good, but I will eventually return. It has taken me months to get the hang of Pinterest.